Fall in Kamloops is truly my favourite fishing season. 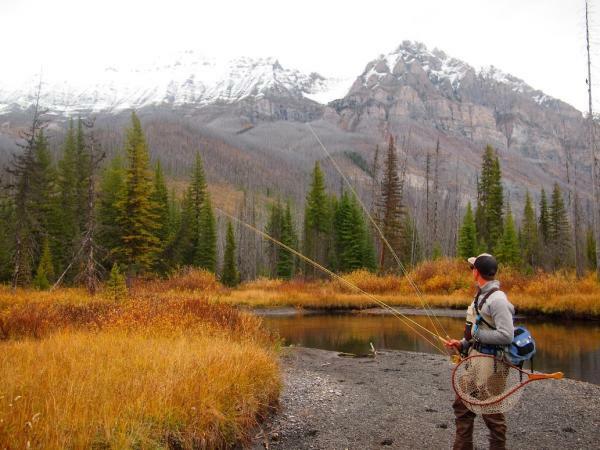 The leaves are turning, the temperatures have relaxed, and trout in every water body in the region is feeding to prepare themselves for the long winter ahead. 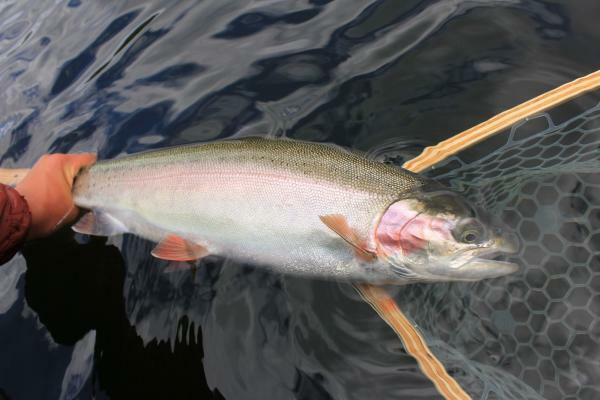 Fall rainbow trout caught on an egg pattern during the sockeye spawn on the Adams River. Whether you prefer cruising the lake, or wandering the banks of a freestone river, Kamloops will not disappoint you with its incredible opportunities for the dedicated angler. During the fall months, trout recognize the cooling water temperatures as a sign to start feeding heavily before ice on occurs, which is usually early December. These fish will move into shallow areas of the lakes, as this is where most of the available insect life and feed can be found, sometimes in less than 3 feet of water, which can make for some incredible sight fishing opportunities. 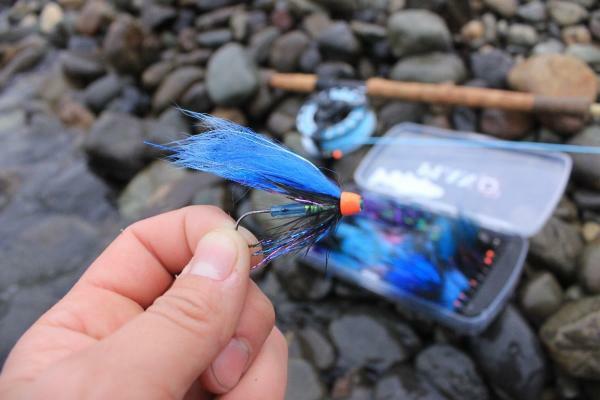 Larger flies, such as leech imitations, and dragonfly nymphs are effective in the fall, as trout are looking for bigger meals to help fatten up before the lakes become covered in ice and insect activity decreases dramatically. Air temperatures can be in the negatives as late November approaches, however these days can be the most memorable! If the colder weather isn’t enough to scare some anglers away, fall fishing also coincides with hunting season, making the waterways less busy than in the spring. Fall rainbow trout from Jacko Lake, near Kamloops, caught on a dragonfly nymph and sinking line. While fishing the stillwaters is a great way to let the fishing season unwind, I find myself walking the river banks more often. Success can be regular, as trout will follow the salmon to their spawning grounds to gorge on their eggs, and then once the spawn is over, these trout will migrate back to their overwintering areas, such as Shuswap, or Kamloops lake to spend the long, cold winter ahead. As fall turns to winter, the trout become more difficult to find, and the ones I do bring to net and release become far more rewarding. Again, before you head out, you must become fluent with the fishing regulations for the areas you wish to visit. 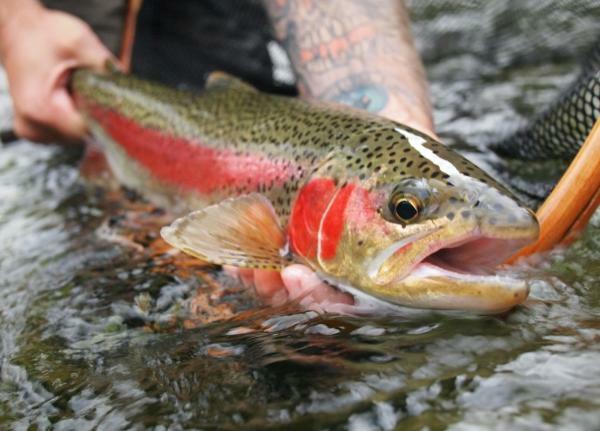 Most trout streams are catch and release, and you must take care when handling these fish, so that we can enjoy them for the future. Once the negative temperatures hit, and I become more reluctant to hit the river, I start planning trips for spring, to familiar waters and new ones. The fall fishing season is a short one, but one that I always look forward to every year, and when I catch some of my most memorable fish. Those who dedicate their time will be rewarded with some incredible fishing in the Kamloops area, and odds are, I will see you out there. **Visitor Centres in BC are now participating in the Go Fish BC - Rod Loan Program, and the Kamloops Visitor Centre is one of them! Each Visitor Centre was provided a number of rods and tackle boxes so several visitors can take advantage of this great opportunity at once. The program is accessible for all individuals and families, locals or visitors. All visitors do is leave a deposit or a credit card number, sign a waiver, and purchase a fishing licence (if they haven&apos;t already got one). The Visitor Centre staff can even assist the visitor in obtaining a licence if needed. The Kamloops Visitor Centre can also share suggestions of nearby fishing lakes that offer fishing from shore, or where boats can be rented. The whole process only takes a couple minutes, and then you can be on your way to a fishing adventure with the use of rods and tackle for FREE!